"MARRY ME AT CHRISTMAS is like a Hallmark's Christmas movie"
MARRY ME AT CHRISTMAS is Book 19 in Fool's Gold series. I was so excited to read Madeline's love story since I read about her crush on Johnny Blaze, a movie star, in the previous book THRILL ME. Madeline Krug is the manager of Paper Moon, a bridal gown store. She loves her job and enjoys helping brides pick the perfect dresses for their weddings. As a favor to the Mayor she accepts to organize a wedding during Christmas, which sounds a joyful challenge for her until she finds out she will be working closely with the handsome movie star Jonny Blaze. Jonny Blaze has been looking for a normal life so he decided to buy a house in Fool's Gold and have a perfect wedding for his sister there, but he never expected to fall in love with Madeline and her town. 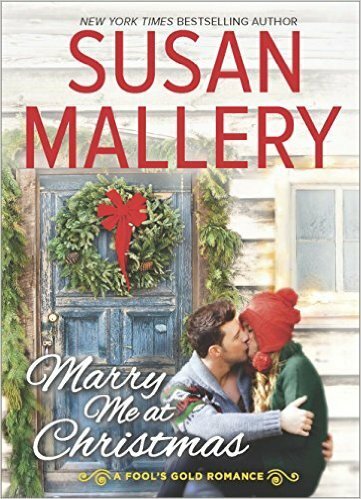 MARRY ME AT CHRISTMAS is like a Hallmark's Christmas movie, a sweet romance of a handsome hero who finds out that not only Madeline is not an ordinary woman, but also she is an extraordinary, honest, beautiful woman. Although Madeline had a crush on Jonny soon she realizes what a wonderful person he is. But can she risk her heart for a famous guy and a dream to have a happily ever after? I really enjoyed reading another fun and sweet romance in the Fool's Gold series and I can't wait to read more in this series.